The BOS Chart Pro tool pack from Adaptive BMS helps you to quickly and easily measure current process failures and set agreed targets to resolve issues. Use this tool to calculate and plot percent quality over time, and construct Pareto charts to help identify the most significant issues. 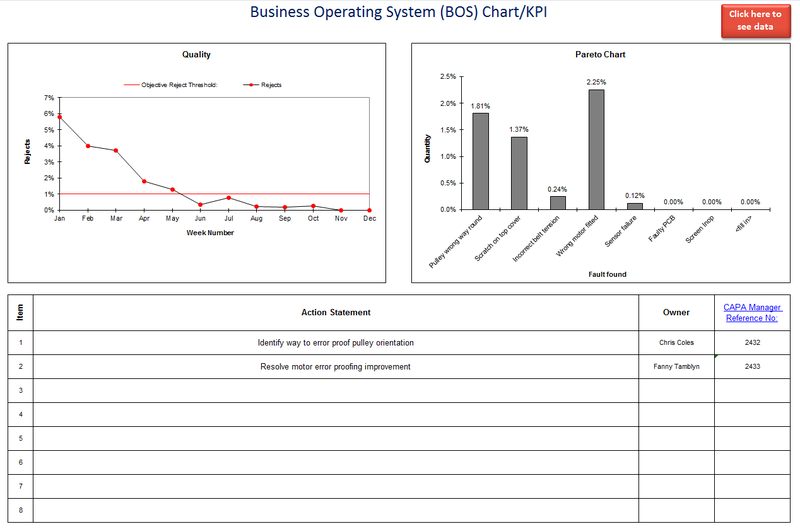 BOS Chart Pro also makes a great quality KPI for your business, and can easily be customized to meet your organization's needs. Easy to follow popup instructions are included, as well as a step-by-step user guide. 1. BOS Chart Pro Microsoft Excel workbook (2003 upwards).